These days, the typical trendy-restaurant-going New Yorker isn’t squeamish about eating variety meats. What foodie, in this enlightened nose-to-tail era, hasn’t tried marrow bones and liked it? Or, for that matter, pig’s feet, pork knuckles, and lamb kidneys? All delicious. And let’s not forget the upper regions: the ears, tongues, and cheeks eaten à la carte or sometimes in an exotic jumble, like Xi’an Famous Foods’ spicy lamb-face salad. Still, it’s one thing to tuck into a nice braised beef tongue or pork-jowl-bacon BLT, and quite another to have a pig’s head plopped down in front of you. Greeks have always had their lamb’s heads and Chinese their fish heads, but for more mainstream offal enthusiasts, a head served whole is where they draw the line. A few chefs, though, would like to change that. 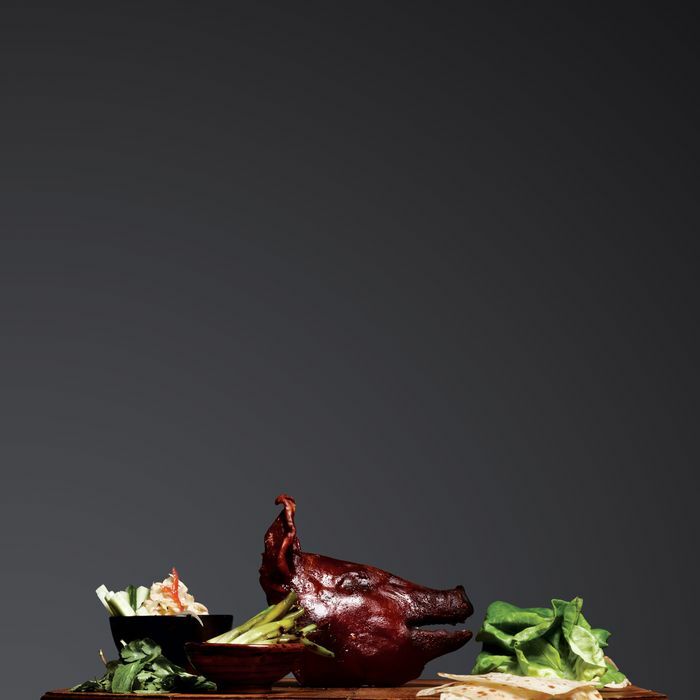 At Marc Forgione’s eponymous restaurant, Thursday night is crispy-pig’s-face night. He soaks, confits, and roasts each order to the point where the skin shatters like a crème brûlée. “It’s one piece, but seven different flavors and textures,” says Forgione, who especially extols the tongue, the point where the shoulder meets the neck, and the meat behind the eyeball. “It’s like the oyster on a chicken.” At the Cannibal, half pig’s heads are brined, braised for twelve hours, crusted with garlic and herbs, and roasted before they’re served gyro style with warm pita. And recently, Maialino has been serving its namesake dish, suckling pig, as a salad special: half a brined, simmered, and deep-fried head elegantly arrayed over chicory leaves.